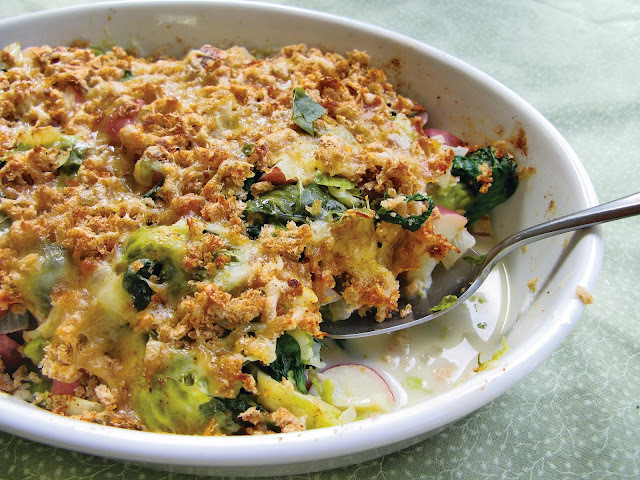 Brussels Sprout Gratin with Potatoes & Spinach & Mollie Katzen's 'The Heart of the Plate' GIVEAWAY! 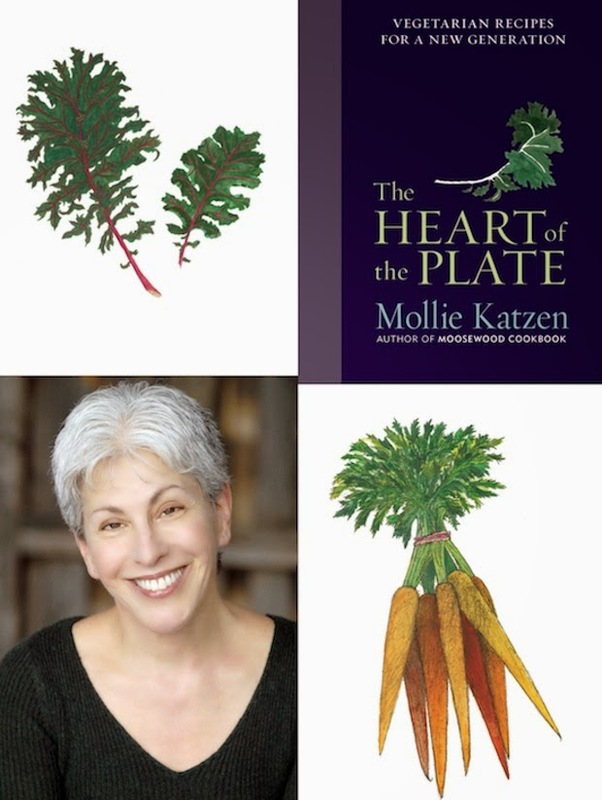 As promised in my article For the Love of Avocados and Other Vegetables: Mollie Katzen - The Heart of the Plate, I am giving away a copy of Mollie Katzen's newly released cookbook, The Heart of the Plate. The giveaway and my review cope are a courtesy of Mollie Katzen, Houghton Mifflin Harcourt and Katzen's wonderful publicist who made it all possible. Thank you, Carrie. I am sharing below a second recipe, Brussels Sprout Gratin with Potatoes and Spinach, from The Heart of the Plate, in addition to the Avocado-Grapefruit-Mango Saladita I posted earlier. I wrote about how much I adore Mollie's recent book. If I didn't own it already, I would wish to win it. The recipes, the illustrations and the photos are simply phenomenal. I am super excited to offer 1 copy of The Heart of the Plate to 1 lucky winner as an early celebration of Food Wanderings' 4 year anniversary Nov. 4. How cool is that? Sorry my international friends, readers with a US address only. Please enter in the Rafflecopter widget below. Share with us which vegetable are you obsessed with recently and which vegetable in your opinion is the most underrated? The GIVEAWAY will run from 12am EST on 10/24/13 till 12am EST on 10/31/13. The lucky winner will be selected via random.org. When I decided on a meal of Brussels sprouts cooked with potatoes, onion, garlic, and spinach and baked under a lacy roof of grated cheese and coarse bread crumbs, I expected the results to be cozy, but lackluster. Except for the cozy part, I was so wrong. Gruyère cheese is ideal for this. You can also use Emmentaler. For the bread crumbs, toast 2 slices of your favorite whole-wheat bread, then coarsely crumble in a food processor. 1. Preheat the oven to 350°F, with a rack in the highest position that will fit your baking pan. Coat a 9-x-13-inch baking pan or equivalent gratin pan with about ½ tablespoon of the olive oil. 2. Fill a medium-large saucepan with water and put it on to boil. When the water boils, add the potatoes and Brussels sprouts and cook them for 8 to 10 minutes, or until they become fork-tender. Drain them in a colander and shake to thoroughly drain. 3. Meanwhile, place a large (10- to 12-inch) skillet over medium heat for about a minute, then add 1 tablespoon olive oil (2 tablespoons, if not adding butter) and swirl to coat the pan. Melt in the butter, if using, and swirl again. Add the onion and ¼ teaspoon of the salt and cook, stirring, for about 8 minutes, or until the onion becomes very soft, verging on golden. 4. Stir in the garlic and lay the spinach on top to wilt. (It will quickly oblige.) Stir it in, along with the drained potatoes and sprouts, the remaining ¾ teaspoon salt, a generous amount of black pepper, and the cream. Mix to get everything thoroughly distributed, then transfer to the prepared pan. 5. Sprinkle the top with the bread crumbs and cheese and dust it lightly with paprika, if desired. Bake for 15 to 20 minutes, or until the cheese is perfectly melted and turning golden. Serve hot or warm. Excerpted from THE HEART OF THE PLATE, (c) 2013 by Mollie Katzen. Reproduced by permission of Houghton Mifflin Harcourt. All rights reserved. What a lovely dish, Mollie's recipes are always simple but elegant. I'm obsessed with Broccoli and I really feel like its underrated. I love it with most of my meals. I need to find more meals to integrate it into, its really difficult to get the family to eat it. This looks like an amazing recipe and the fact that the cheese is optional is so great! Me being me will probably add the cheese but its nice to know that it's flavor is not dependent on it. Brussels sprouts are my favorite seasonal veggie!!! This looks amazing...would love to win the book! Obsessed with eggplant - love it roasted! turnips are underrated. I love the baby white ones. Wonderful gratin, the flavors sound so tasty together! ive been so into butternut lately! I currently love kale...raw, roasted, puréed in smoothies. So good! Love the simplicity of the ingredients - just goes to show all natural = delicious every time! I am not that much spinach but my picky husband would enjoy your gratin completely shulie. He likes food that I don't really enjoy, odd no? Intoxicating fall flavors! Vegetables have so much to offer in the way of flavor and texture and this recipe is an outstanding example! I am crazy about eggplant lately. I find myself roasting one every other day almost. An underrated vegetable would have to be the parsnip - like a carrot except subtle and very forgiving. Comfort food at its best!! Love bsprouts! I think the books sounds incredible and what a fun review to do! I think celery root is under rated! A beautiful dish! I am a big fan of Brussel sprouts and vegetable gratins. This recipe looks really delicious. I love the blend of vegetables with gruyere, a favorite of mine. This looks like a wonderful gratin. It sounds like Mollie has a hit with her new book, and kudos to you for the lovely execution! I wonder if I can get my boyfriend to eat brussels if I make this. It sounds delicious! Thank you for posting this recipe. It is delicious and filling!